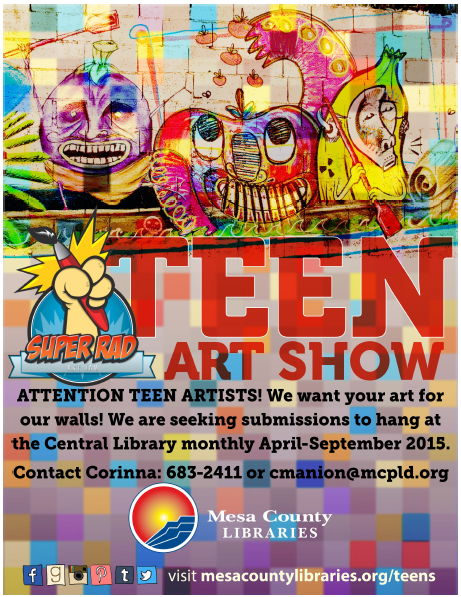 Mesa County Libraries and Super Rad Art Jam are seeking art submissions in all mediums and subjects from teen artists in Mesa County. Work will be collected February through May 2015 and displayed in the Central Library Teen Area during one of the following months: April, May, June, July, August, or September 2015. Any student in grades 6-12 is eligible to submit work. Work is to have been completed in the past two years. All work should be original in concept, design, and execution. All submitted entries must be ready to display, matted with a hanging device, or based for three-dimensional work (display space is limited for 3-D work). Artwork will be shown for one month. Download a submission form today! Submissions may be dropped off at Central Library’s Children’s Center Desk anytime during regular library hours. For more information contact Teen Librarian Corinna Manion at 970-683-2411 or cmanion@mcpld.org.